Net sales increased to SEK 623 (494) m and gross profit increased to SEK 354 (282) m.
Profit from property management improved, to SEK 149 (89) m, equivalent to SEK 1.09 (0.65) per share. Profit before tax was SEK 231 (18) m and profit for the period was SEK 179 (923) m, or SEK 1.31 (6.76) per share. The decrease in profit for the period is mainly due to significant profits in 2012 from the sale of the Hemsö portfolio. Cash flow from operating activities was SEK 54 (56) m, or SEK 0.39 (0.41) per share. Net sales were SEK 2,224 (2,110) m and gross profit increased to SEK 1,301 (1,218) m.
Profit from property management increased to SEK 549 (445) m, equivalent to SEK 4.02 (3.26) per share. Profit from property management was SEK 1,030 (371) m and profit for the year was SEK 862 (352) m, or SEK 6.31 (2.58) per share. The increase in profit for the year is mainly due to 2012 being charged with provisions for tax risks. Cash flow from operating activities was SEK 480 (123) m, or SEK 3.51 (0.90) per share. The property portfolio excluding modular buildings consisted of 366 (275) properties as of 31 December 2013, with a book value of SEK 20,338 (14,247) m.
The Board of Directors is proposing a dividend of SEK 1.25 (1.00) per share. On 2 December, Kungsleden took possession of the 84 properties purchased from GE Capital Real Estate for SEK 5.5 billion. In addition to the GE transaction, Kungsleden purchased 4 properties for SEK 226 m. No properties were sold. Effective 1 October, Kungsleden introduced a new Business Management Group, replacing its previous Group Management. Marie Mannholt was appointed as Kungsleden’s new Marketing & Corporate Communications Manager, and a member of Business Management Group, effective January 2014. Kungsleden issued a three-year unsecured bond of SEK 700 m, accruing interest of 1.95 per cent above the Stibor benchmark rate. Kungsleden’s new strategic direction was presented in February. Operations will focus on owning, managing and improving properties in growth regions around Sweden. Biljana Pehrsson became Chief Executive Officer effective 1 September. Kungsleden purchased 95 (11) properties for SEK 5,935 (1,549) m, and sold 4 (44) properties for SEK 109 (1,115) m, generating a profit of SEK 8 (16) m.
Final closing for the sale of Hemsö to The Third Swedish National Pension Fund (AP3) a transaction mainly settled in 2012, was in February. 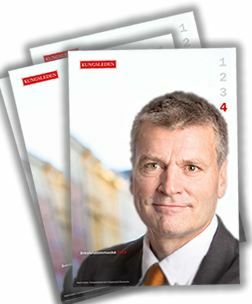 I can look back on the fourth quarter of 2013, my first full quarter as Kungsleden’s Chief Executive Officer, with satisfaction. Implementation of Kungsleden’s new business plan and strategy continued with high intensity. We closed the year by taking possession of the 84 properties we purchased from GE Capital Real Estate for SEK 5.5 billion on 2 December. This transaction was the largest on the Swedish property market in the year, and is a momentous advance for Kungsleden strategically and financially. Through the purchase, we attained a portfolio volume we expected to take one to two years to build at a single stroke. Geographically, about 70 per cent of the purchased portfolio is located in the highly attractive markets of Stockholm and Gothenburg. With this transaction, the share of properties in the three major city regions increased from 30 to 50 per cent of Kungsleden’s total portfolio, simultaneous with the office share rising from 39 to 50 per cent—all of which is consistent with our new strategy with its focus on growth regions and selected property segments: office, industrial/warehouse and retail. In purely financial terms, the GE portfolio will make a major contribution to Kungsleden’s improved profit and cash flow, particularly considering the bank funding cost for the acquisition. The GE transaction is also significant because it brought Kungsleden competences, when we took on some 20 property managers, lessors and administrative specialists from GE. Overall, Kungsleden had 94 employees in property management and group-wide functions by year-end. And we will now continue on our onward journey of implementing our new strategy together. The new Kungsleden also features a more focused organisation and improved control. Our new Business Management Group was formed in the quarter and has focused on how to satisfy customer needs for premises of any size. The three new business areas of Property Management, Property Development and Transaction & Analysis are all running at full speed on forward-looking activities. In Property Management, the GE properties and associated staff have already been integrated into our business. The Property Development business area is doing tangible work on a number of attractive and potentially value-creating development projects in different phases. Transaction & Analysis is working on optimising Kungsleden’s property portfolio, which will cover the sale of non-strategic properties and more purchases pursuant to Kungsleden’s new strategy. For all three business areas, the standard for 2014 and beyond has been set high. Results for the quarter Profit from property management increased by 67 per cent to SEK 149 (89) m, as an effect of net purchases of properties, mainly from Hemsö but also from GE Capital, towards year-end. Administration costs were also down SEK 11 m compared to the previous quarter, contributing to our figures. A summary of 2013 The strong profit contribution from the fourth quarter, including that from the GE properties, meant we were able to deliver good full-year profits for 2013. Our profit from property management was up 23 per cent on 2012, at SEK 549 m. There are also big improvements further down in our Income Statement, where the value changes on properties and financial instruments were clearly positive, with there being no need to charge the year with any provisioning for tax risks. Net profit after tax for the year was SEK 862 m, up by over SEK 500 m year on year. Our financial progress demonstrates that Kungsleden is well in line with its previously reported financial targets. Re-investment of the funds freed up by the Hemsö sale has been completed—ahead of schedule. The goal of saving 10 per cent on central administrative costs has been achieved—ahead of schedule. With these actions, we can summarise by saying we’ve restored Kungsleden’s cash flow and earnings capacity in 2014 to levels prior to the sale of the Hemsö portfolio at the end of 2012. Outlook The economic outlook in Sweden is positive. We’re noting improved demand for premises in our segments and markets. The New Year has seen several major transactions being completed. A greater appetite for property transactions among banks and investors is engendering hope of positive property value growth in 2014. In the year we took momentous steps towards becoming a company that actively owns, manages and develops the right kind of properties, with the aim of maximising cash flow and building property value for the long term. Kungsleden is going into 2014 with its property portfolio 40 per cent larger, a better structure and restored earnings. This means we’re well prepared for continued value creation for tenants and shareholders. We still have to master a number of protracted tax proceedings. Apart from our increased earnings, we also have a stronger financial position with a 37 per cent equity ratio and liquidity contingency of SEK 2.7 billion under our belt. This good position is enabling the Board of Directors to propose an increased dividend of SEK 1.25 (1.00) per share for 2013. Kungsleden AB (publ) discloses the information in this press release according to the Swedish Securities Markets Act and/or the Swedish Financial Trading Act. The information was provided for public release on 13 February 2014 at 8:00 a.m.